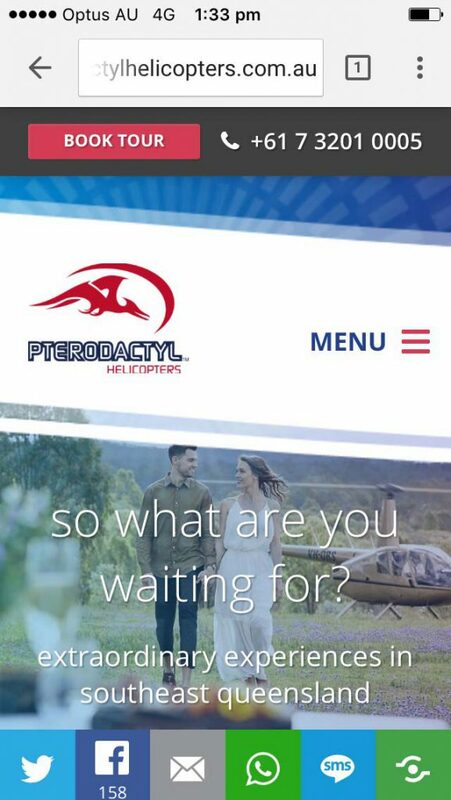 Mike Jarvis, owner of Pterodactyl Helicopters, was one of my first clients, and to this day his website continues to be one of our greatest success stories. 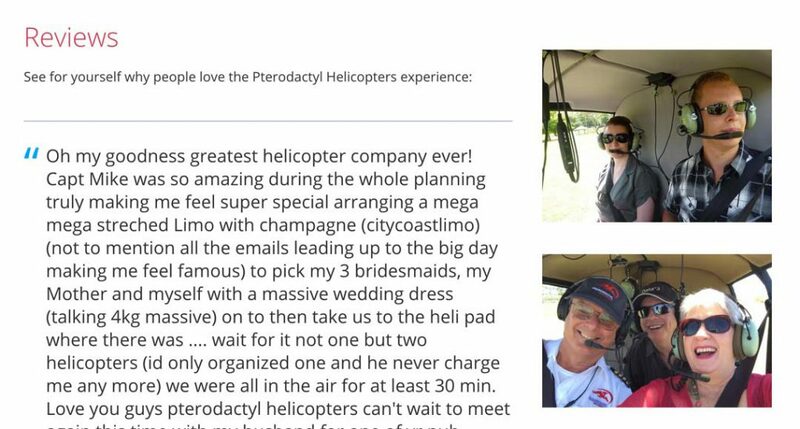 Originally Mike needed a content management system that he could update with news, photos, and info about the helicopters, with the option for customers to contact him if they wanted to book a flight. 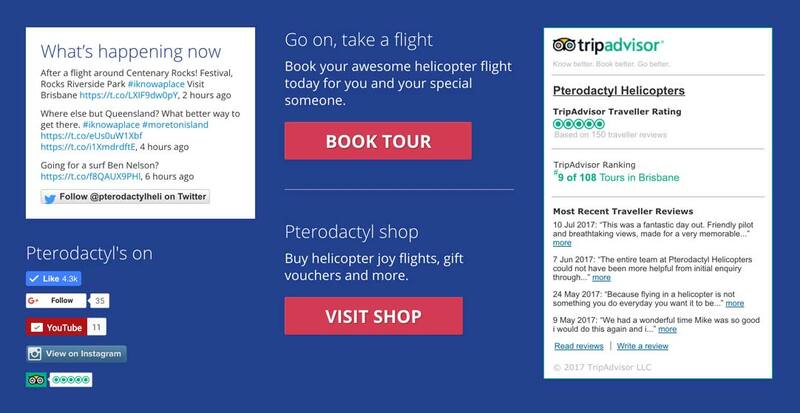 The site has evolved continually, to include functionality such as specials, a calendar of his flights and locations, a shop for tour bookings and gift vouchers, a 3rd party integration for all of the forms with his CRM (Zoho), a reviews system, and 3rd party integration with external services that are important to Mike’s industry such a TripAdvisor. 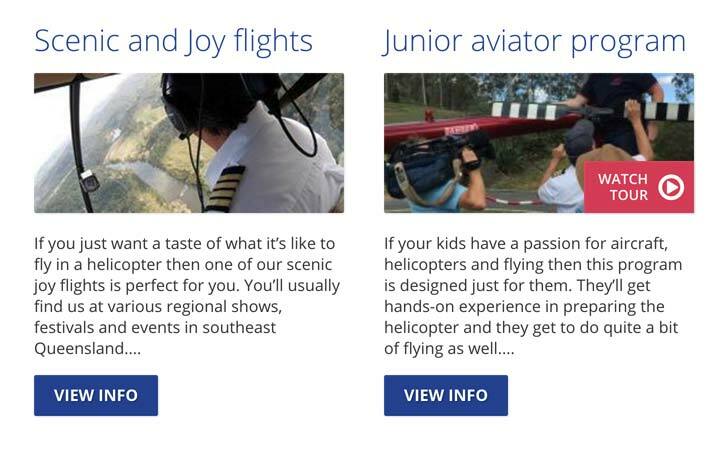 Design-wise Mike wanted a website to stand out from other helicopter tour companies. I went through the standard design approval process with Mike, then got to work coding the WordPress theme, including the creation of several custom post types and integration of various plugins to suit his requirements – such as the creation of tours and flights, flight calendar, blog, shop, etc. All of this is easily updatable by Mike and doesn’t require any web coding experience for him to change and add to. Early 2013 I started helping Mike climb the SERPs a little higher on Google by providing SEO (search engine optimisation) services, and optimising and branding both Google Places and YouTube accounts for his business. Throughout the SEO contract, I worked on fleshing out his copy – both writing new content, and editing existing content. This content overview helped Mike achieve – and importantly, maintain – a #4 position in Google for his desired keywords, and he tells me frequently how in the long-term it has boosted his online enquiries significantly. In August 2013 I upgraded the site’s desktop-only theme and created a responsive theme (meaning that the site adjusts its content depending on whether you’re viewing the website from desktop or handheld device), and upgraded his events management area. Turning Mike’s website responsive means that it’ll look great, no matter where it’s viewed from! In 2016 Mike and I began an intensive redesign of the site to bring it in line with newer standards, as the original site was now several years old! 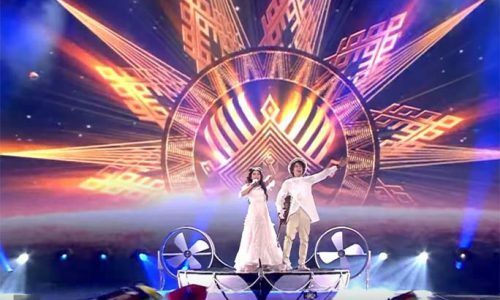 It was serving its purpose still but we both wanted it to have a fresh, clean look that took advantage of the exciting new features that the latest HTML and CSS standards have to offer. WordPress has always managed all of this with beautiful simplicity. WordPress was chosen because Mike can update everything himself so, so easily. A lot of it is automated, too, and I worked hard to ensure that Mike doesn’t have to post the same content twice – ever. I suggested he use twitter for his weekend specials, and now when he tweets them, they automatically appear on his website’s Twitter feed; when a new customer posts a review to TripAdvisor, it automatically displays on his website’s TripAdvisor feed; when Mike posts a new photo to Instagram, it automatically adds the image/s to his Instagram feed. Feedback from Mike has always been positive. He loves the site; loves how he can update it, loves how social media has been made useful to him and his business, and loves how integrated and easy WordPress is to use. In other words, this website was, and still is, a complete success! Categorisation of many flight types, ability to add videos to specific tours. 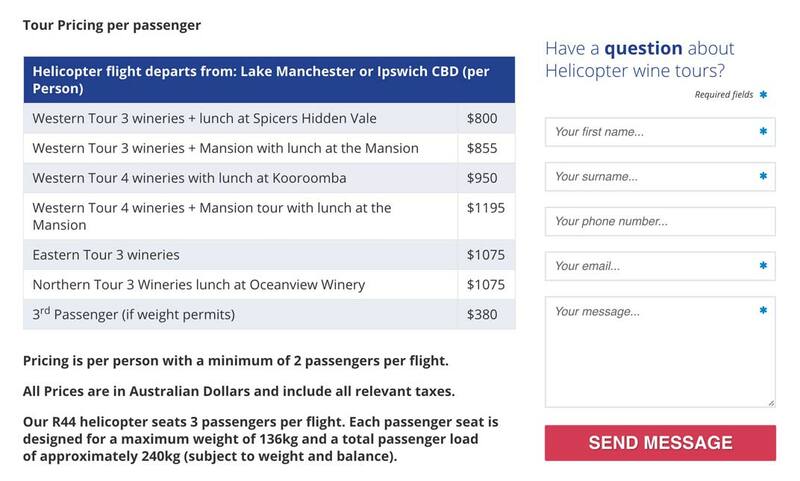 Each flight page has room for lots of details (all created by the client) and a direct contact form. 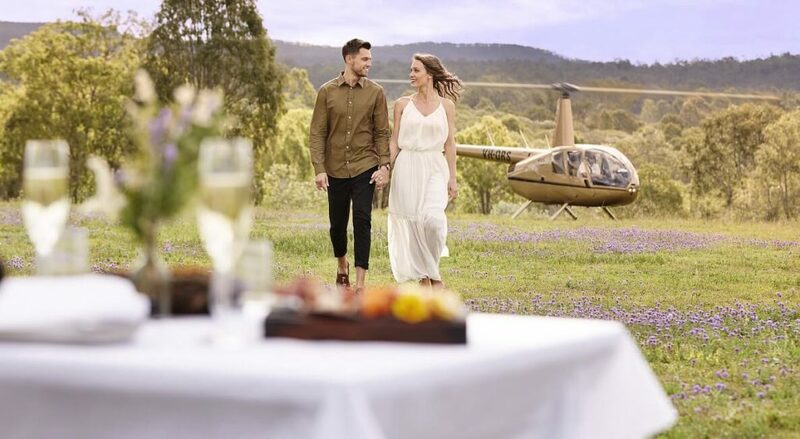 All the social connections that matter to a tourism-industry website! 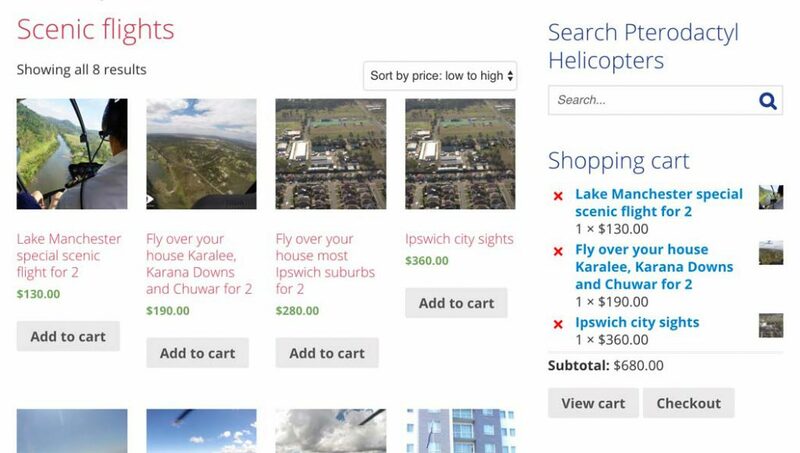 Purchasing flights directly from the website. Automatically drawing in latest Instagram images. 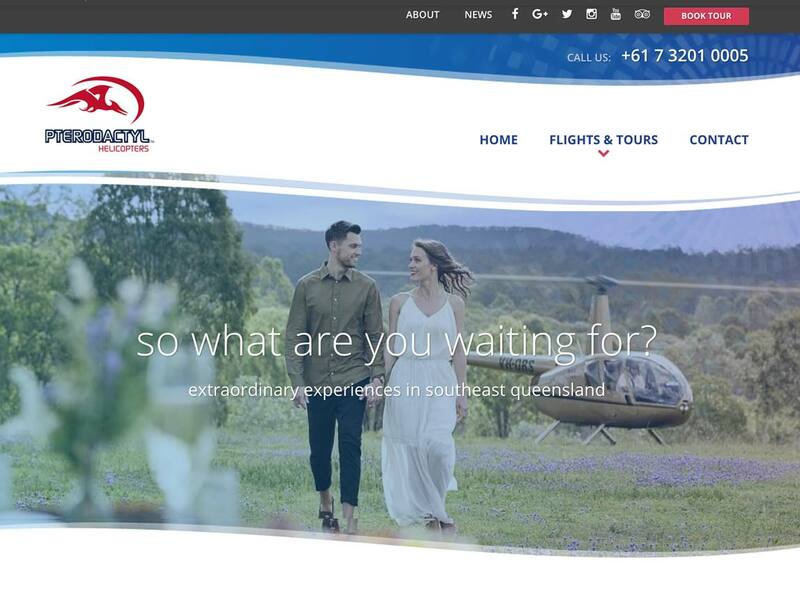 Option to customise header image per flight.